Appearing on The Late Show with Stephen Colbert on Tuesday night, Gillibrand said she is forming an exploratory committee as a first step toward running for office. Gillibrand, one of the most vocal critics of the Trump administration, joins a lineup of other female candidates seeking the highest office. Fellow Senator Elizabeth Warren and Representative Tulsi Gabbard have already announced they will run; former Housing and Urban Development (HUD) secretary Julián Castro has also announced his candidacy. Gabbard, who has a history of attacking the LGBTQ community as a state legislator, and Warren, who spoke out against medical rights for transgender prisoners, have come under fire by the LGBTQ community for their less-than-perfect record on LGBTQ issues. Warren has since apologized for her stance and now supports the right of trans prisoners to medically transition while incarcerated. Gabbard has also apologized for her previous viciously anti-gay remarks, saying she has evolved her thinking over the years. 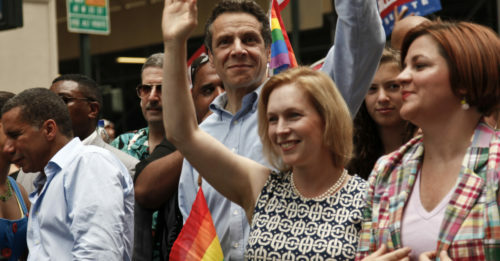 Gillibrand, however, has a history as an LGBTQ champion. The Democratic Senator was a driving force behind the repeal of Don’t Ask Don’t Tell and has worked to combat sexual assault in the military. She was the featured speaker at the Human Rights Campaign’s New York gala in early 2018. “Senator Gillibrand is on the front lines of the battle against the Trump-Pence administration’s politics of hate, fear, and discrimination,” HRC President Chad Griffin said at the time. “From fighting back against Trump’s transgender military ban to pushing for LGBTQ non-discrimination protections, Senator Gillibrand stands shoulder to shoulder with the LGBTQ community as a champion of equality. Critics, however, point out that Gillibrand’s pointed remark that former Senator Al Franken should resign after allegations of sexual impropriety surfaced, was instrumental in forcing the liberal stalwart out of office. She has also said that former President Clinton should have resigned after having an affair with an intern. Gillibrand was appointed to her Senate seat after Hillary Clinton became Secretary of State. The Clintons have been powerful supporters of the Gillibrand and her swipe at former President Clinton has widely seen as a shot across the bow that she was willing to stand up to powerful men in government.